You don’t want to be like everyone else! Your logo should be exclusive to your business. Pro tip: avoid the same roof peaks that every other agent has in their logo. Your logo needs to look good in all formats, and different sizes. For example, it needs to look just as amazing on mobile as it does on a billboard. The more flexibility you have with color, background placement, etc, the happier you’ll be. Pro tip: avoid having a color block background because it will look like a weird square/rectangle on everything you publish it on. Clean lines, symmetry and the neutrality of a design can make it timeless. Pro tip: avoid the current trend because it will have an expiration date. Try to capture the essence of your company in the logo. Easier said than done, I know. Consider how well your logo matches your company’s personality. For example, if you are a luxury agent, you wouldn’t want to use a cartoon or something overly “fun”. Pro tip: don’t be afraid to have fun, just keep it real. If you successfully follow these 4 simple rules to create a logo, then your design is likely to be on the road to greatness. 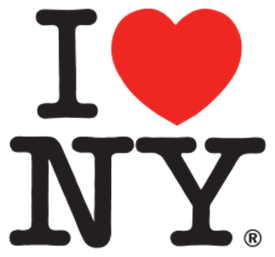 The “I love New York” logo was designed in the 70’s and today still generates over $30M in revenue. That’s a GREAT logo.